[Source: Jahna Berry, Arizona Republic] — The same week that Phoenix leaders imposed a 2 percent food tax to prevent layoffs and painful cuts to city services, City Council members agreed to spend $6 million to buy a vacant motel so Arizona State University can expand its downtown campus. The city plans to buy the old Ramada Inn at 401 N. First Street with $5 million left over from a 2006 city bond that was enacted largely to help construct ASU’s downtown Phoenix campus, plus roughly $1.3 million from the city-owned Sheraton Phoenix Downtown Hotel’s capital improvement fund. 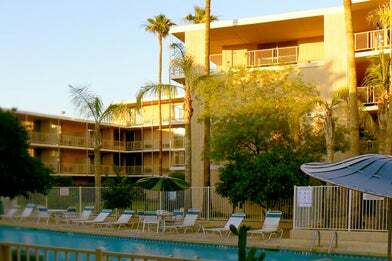 The city and the motel property’s owner, Phoenix-based City Centre LLC, have not finalized the sale but hope to before it is due to be sold at a foreclosure auction on March 2. The city has been eying the property for years but was put off by the price, which was once as high as $30 million. Now, it wants to buy the property before it goes to auction, where it may lose it to another buyer. Records show City Centre owes its lender $5.2 million. Until ASU officials decide what to do with the site, Phoenix plans to raze the motel and build an overflow parking lot with up to 250 spaces for the Sheraton. The Phoenix City Council unanimously approved the deal Feb 3. The city-controlled hotel board approved the transaction on Friday. “I felt this was a good purchase for the city at this time,” said Councilman Bill Gates. “The city could acquire property important to downtown and important to the ASU campus.” But a taxpayer advocacy group said the city should at the very least use the extra money to pay off debt already incurred for the campus. Kevin McCarthy, president of the Arizona Tax Research Association, said the hotel purchase also highlights government tactics to spend money on projects not specifically approved by voters. Posted on February 21, 2010, in City Hall, Downtown Vitality, Visioning and Planning and tagged Arizona Tax Research Association, ASU, Bill Gates, City Centre LLC, empty lots, Kevin McCarthy, parking, Phoenix City Council, Ramada Inn. Bookmark the permalink. Leave a comment.